After carefully studying the case, we decided to use only a regular service which can absorb the rough programme of shipments by contemplating the possibility of making them without the TU having to be completed and with the possibility of shipping at least 5 cars and a maximum of 10 cars per ship. We selected the shipping company that stops over in Bilbao port on a conventional multi-purpose service, leaving at least twice a month without stopovers and with a transit time of 30/34 days to the port of San Antonio. All of the ships of this company have certification that they meet the ISM international sea transport regulations. We have discarded the use of other break bulk services as a possible alternative, because as they are subject to a minimum inducement they were unable to define a regular calendar of ships for us or the guarantees of laycan and transit time. 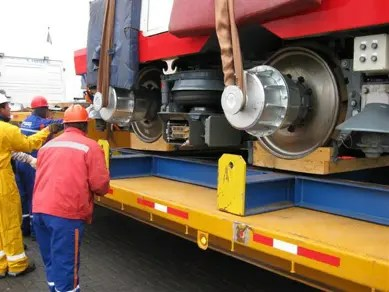 With respect to the road transport and in order to guarantee the car loading and unloading operations, we have the collaboration of transporters specialised in railway transport which have the necessary towing apparatuses for this kind of operation. 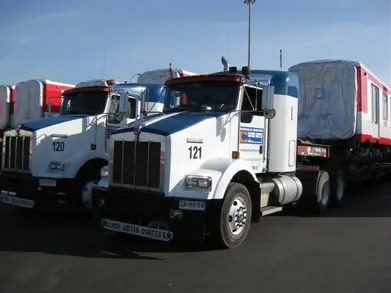 This contract includes the administrative formalities, the port operations in San Antonio, the authorisations and coordination of accompaniments, the road transport in Chile, and unloading operations, control of the project and its components until delivery to the final location, which will be co-ordinated by our agent in Chile, a company which has carried out all of the transport operations for Metro Chile for more than twelve years. The preparation, development and follow-up of this project will be carried out through companies consolidated in the area of special transport and with similar experience in transporting passenger trains. 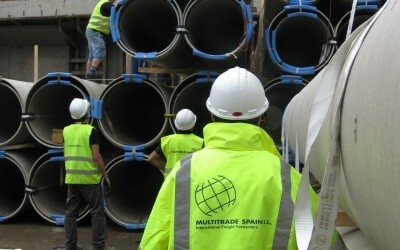 The team and similar operations to the Metro Chile project assure real knowledge of these kinds of projects. We plan the loading of each unit one working week ahead of shipment in order to make reception in Bilbao port and to carry out the corresponding customs export processes. The carriages will be placed on the factory railway with the intercommunicators covered or the awning in place. Each carriage will be loaded on the trailers prepared by the transporter according to the usual procedure. The carriages must have points for hooking and/or lifting for loading on the truck. Before departure, the necessary elements for securing and stowing the TU in transport will be put into place. The transporter, in coordination with MULTITRADE SPAIN, will deal with acknowledging the routes of the corresponding factory to Bilbao port in order to get the authorisations for special transport. We plan for a 1-day transit from the factory to Bilbao port. 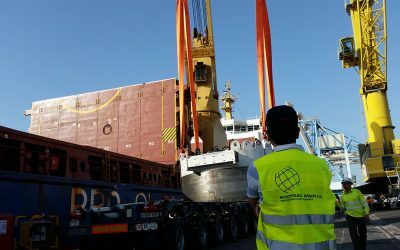 The drivers will place their trailers correctly in the reception area in the port, where the carriages will be lifted and the cradles supplied by Multitrade Spain for support on land and travelling in the ship will be installed. The bogeys and hooks must be completely immobilised to avoid them rocking and shifting. 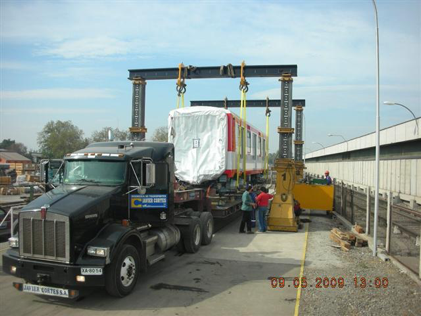 We will load the carriages using the installed lifting bolts as described in the shipping procedure. The shipping company will deal with the stowing below deck throughout the project and with fixing the carriages on board to the points prepared and previously indicated by the technical department. The choice of San Antonio instead of Valparaíso was intended to avoid the restrictions in operating in a port under conditions of extreme congestion and which is at the centre of the city. 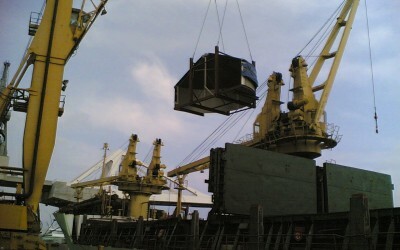 The shipping company, in coordination with our agent, will deal with directly unloading the carriages onto trailers. The special transport circulation authorisations will be processed by the transporter designated by our agent. The transit time from the port to Santiago will be approximately of 2 days. This estimate may vary depending on traffic restrictions, official holidays or weather conditions. Considering our programme of shipments of a maximum of 10 carriages, the transport has capacity to move the 10 transport modules simultaneously with 45 days’ forewarning. The transit time from Port to Workshop Station is approximately 48 hours. The route will be inspected and confirmed prior to applying for the permits. Once in Santiago there is no significant difficulty in reaching the location which has been indicated as the unloading place. The trailers will be correctly placed on the base where the unloading will be performed by mega lift. The specific elements for stowing will be removed. A team from the transporters will prepare the unloading of the carriages according to the habitual procedure.